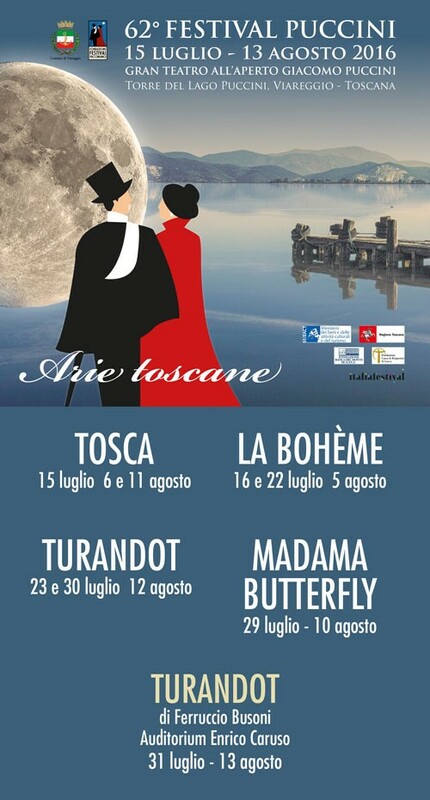 The great Puccini classics Tosca, La Bohème, Turandot and Madama Butterfly in the 2016 programme of the Torre del Lago Puccini Festival. New this edition – the first performance in Torre del Lago – of Ferruccio Busoni’s Turandot. The same subject set to music by Puccini but proposed by the composer from Empoli in a decidedly more ironic fairytale style that remains one of the most significant works in the vast Busoni artistic productions. The 2016 Puccini Festival curtain will rise on July 15 with Tosca with replicas on 6 and 11 August. Tosca will alternate: La Bohème, with three performances scheduled the 16 and 22 July and 5 August; Turandot with three performances 23 and 30 July and 12 August and Madama Butterfly with two performances on July 29 and August 10. Novelty of the 2016 Torre del Lago Festival billboard is the proposal of the Opera Turandot by Ferruccio Busoni also a Tuscan composer, born in Empoli in 1886, that had been fascinated by the fairy tale by Carlo Gozzi before Puccini and had wrote an opera on his own libretto. Busoni’s Turandot, premiered at the Municipal Theatre in Zurich on May 11, 1917 and remains among one of the most significant works of his rich artistic productions – fruitful and active composer in every field of musical creation that left a total of about 100 musical between numbered and unnumbered productions, including plays, vocal, instrumental, chamber music, pieces for piano, organ, violin and other instruments, Lidier, as well as numerous transcriptions, revisions and elaborations of works by other authors – It took Busoni 100 days to write the Turandot score, a record time but, needed to not miss the opportunity that the Theatre of Zurich had offered him to host his composition. Since the latter was too short, in 100 days Busoni wrote the two acts in 4 quaters of his Turandot, an Italian opera written in the eighteenth century style with extraordinary liveliness and richness of rhythms that differ from Puccini for that burlesque tone added to the gozzian fable which makes it deeply enjoyable.